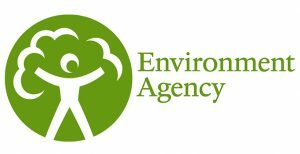 Do you want to do something to help our rivers but have no free time to volunteer? Looking to change your ways to be more environmentally friendly? Well why not start now, and follow these 5 simple changes you can make in your day-to-day life which will massively benefit our local rivers and the wildlife that depends on them! 1. Remember the 3 P’s – Pee, poo and (toilet) paper! Not only is this good for the environment, but your sewage pipes will thank you too. Remember that only the 3 P’s can be flushed down the toilet, everything else must go in the bin. Even if wipes, nappies, sanitary products, cotton buds etc. claim to be flushable or biodegradable you must not put them down the toilet. A build up of unflushable products in sewage pipes can cause them to become blocked resulting in flooding and pipe damage which costs water companies a lot of money to fix. These products can also end up in rivers, impacting wildlife and water quality, and as they usually contain plastic they will not biodegrade. This is the reality of flushing sanitary waste down the toilet! 2. Don’t be a litter bug! Never throw your litter onto the ground or into a river. It hurts wildlife as well as domestic pets, is an eyesore and is dangerous for children if they play in areas full of litter. 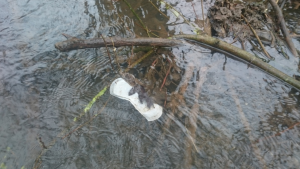 Once in the river, litter can cause blockages resulting in flooding and will be washed downstream to the sea where it will pollute the ocean, harm marine wildlife and end up on beaches. Always take your litter home with you, and if you see litter other people have dropped then pick it up if you can. You could volunteer to organise or take part in a community litter pick too! A stream which is more of a rubbish tip than a river! 3. Only rain down the drain – never dispose of anything in roadside drains! The drains on the roadside are called storm drains, and are there to allow water to drain off the road. Most of them lead directly to the nearest river, where the water goes in untreated. 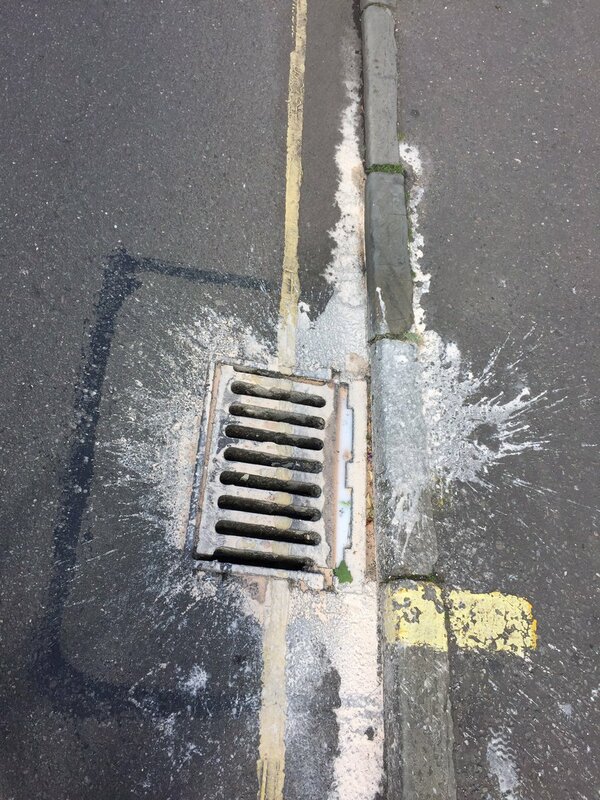 Only rain is meant for these drains, so please never put any harmful chemicals down them, or household products like oil or paint as they can seriously degrade water quality and kill wildlife. 4. Look at your cleaning products, try to use those which are eco-friendly for cleaning and laundry! Many household cleaning products contain ingredients called phosphates. After the detergents have been used and washed away, the phosphates are able to remain in the waste water when it is put back into rivers. This is a problem in rivers because the phosphates act as a fertiliser for weeds causing harmful algae to grow, preventing the growth of other plants which are needed to keep the river healthy and for wildlife to eat. 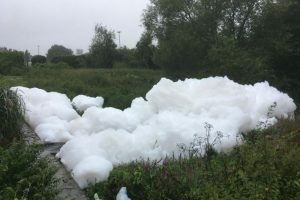 In some more serious pollution events, like in the photo below, chemicals can cause the whole area to be smothered in foam resulting in fish kills incident. 5. Support Bristol Avon Rivers Trust! 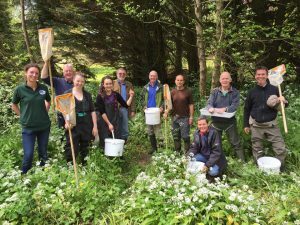 You can help support the work we do through volunteering, becoming a BART Beacon, training as a Riverfly Monitor, following us on Facebook, Twitter and Instagram or by giving us a donation.